As I talked about in Part 1, you entered law school already disconnected quite a bit from what you’re really all about. But that alone isn’t what makes you so miserable now that you’re an attorney. Nope, it’s the law school pedagogy itself that is a huge part of the problem, and really deepens and almost cements that disconnect. It’s the second whammy. 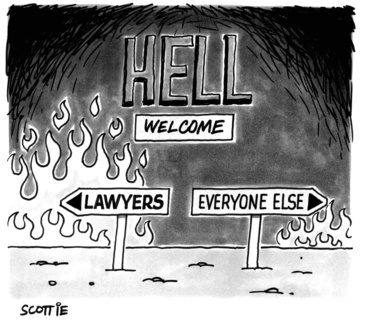 Lawyers are, in fact, in their own special hell. Thank you, law school! I got this insight just recently, while having lunch with Dave Shearon, an attorney with a master’s in positive psychology who was instrumental in leading Tennessee to be the first jurisdiction to approve resilience coaching for attorneys as CLE-eligible. He is working on a fascinating book, Thriving Through the Five Challenges of Law. I didn’t think the teaching was all that subtle, frankly. Any time I voiced a concern about anything remotely touchy-feely in class, like money not equalling redress, I usually got mocked either by the professor or my fellow students. It felt awful, like I didn’t count and like I was being dismissed (only because I was). This is not a surprising experience for someone who is an F (Feeler) in the Myers-Briggs Typology Indicator. But then, I did what most law students do: I quit listening to my more touchy-feely side. I sucked it up and said to myself that I needed to not care, that caring was a liability. Yeah, those were some really fun years. That’s not a helpful response, to put it mildly. To successfully navigate this kind of emotional chasm, between what you believe and what you’re doing, requires a high level of self-awareness. Of course most attorneys have that in spades, right? Otherwise, these kinds of unaddressed, unresolved conflicts often—maybe usually—lead to things like depression, anxiety, substance abuse, and even suicide. Which all, not surprisingly, occur at a much higher rate among lawyers than in the general population. The depression rates, for example, don’t spike until after students have been in law school for about 6 months. Coming in, law student show the same depression rates as other college graduates, between 6% and 9%. After 6 months of law school indoctrination, the depression rates in law students have skyrocketed to 30%. That is disturbing. 3Ls actually show even higher depression rates, up to 40%—one study even pegged the clinical depression symptom rate at 53%. It gets a little better once students become working lawyers, dropping back down to around 30%. Oh, yipee! Lawyers also exhibit 5 to 15 times the rate of anxiety, phobias, and interpersonal sensitivity than the general population. Again, the rates for anxiety and hostility look the same for entering 1Ls as for the general college senior population; they start climbing during law school. That’s right, it’s not just the people in your firm or practice group: lawyers overall are, in fact, extremely thin-skinned and take offense at just about anything. And, they are proven unproductive worriers (i.e.., the anxiety). What a horrible price to pay for disconnection. These number, folks, are why I blather on constantly about connecting with your joy, your dreams, your inner wisdom, whatever label you like. I don’t care about the label. I care that you reconnect with whatever it is, that real you. Because that disconnection is what is causing your unhappiness, more than anything else. You can reconnect with your soul’s dreams for life and work, no matter how long you’ve been disconnected. It’s waiting there for you. You knew, once, before those dreams got buried under a bunch of shoulds and oughts and the punch-list lifestyle. Next time, I’ll talk about ways to rediscover who you really are and tap into your true nature. Listening to your true nature guides you the most quickly to the work and life you deeply crave, as I discuss in Part 3. Jennifer Alvey is a recovering lawyer who helps unhappy attorneys reconnect to their dreams and hopes, and grow those dreams into a better career and life. Find out what that’s like with a discounted sample coaching session. One hour that can change your life! Email jalvey@jenniferalvey.com today to schedule yours. I think you are my new hero. Your blog is helping me to identify and put a name to what has been disturbing me about the law since my first year of law school! I bet if there was a study that asked a person, “What was your happy ‘set point’ before law school and what is your happy ‘set point’ after law school,” you’d get about 95% of people saying that their default happiness level is way lower. I’m not clinically depressed, but I’d say after college, before law school, I was generally about an 8 on a scale of 1-10. As a 5th year associate now, I’d say I’m about a 2-3 during work hours (on a day when no one’s on my back about something) and a 5 outside of work hours. Practicing law generally increased my well-being. Having to show up for work every day and actually be productive, as well as having a group of stable, generally wholesome people (compared, in particular, to college) to interact with, was completely different than the painful chaotic isolated desert that was college and law school. JP, what sort of law do you do? I do disability law right now. The practice itself is fine. I also worked in a smallish 100 person firm is a non-major metro area. The people there were fine, too. I’ve generally worked with relatively nice attorneys who generally get along with each other. I’ve seen these recent articles about law students being depressed and they surprise me. I kind of wonder if the explanation for that is far outside of what we expect. Generally, I found law school to be very interesting, engaging, and frankly pretty easy. I heard people complain about it when I was there, but I think that part of that is because their undergraduate majors had been very light duty, so they weren’t prepared for any real work. I suspect that might be what causes a drop in mental status for law students. Law school is somewhat unique for graduate schools in that a lot of students who enter it have very easy undergraduate degrees, where as most other graduate programs are pursued by people who have an undergraduate degree in that topic. If the undergraduate pursuit was difficult, the graduate one will be too, and that will be no surprise. With law students, however, you have people who have degrees in political science or the like, and law school is going to be much different, I suspect. When the reality sets in, it’s depressing, and it also probably seems that the student, with no other skills, is now in a bad situation which they must ride out in the hopes that the practice will be better. I don’t know that law schools really operate to try to separate out the student’s morality from legal thought much either, although the very study of the law does that to some degree. Law schools themselves are reservoirs of refugees from the law who make up a percentage of the teaching staff, and law school professors fairly frequently have distinct views on the way things ought to be, rather than are, that colors their teaching. For those reasons, I think that generally depression in law schools is separate from the same thing in the profession, although the same people might in part experience it. Part of the big let down in the profession is that in many instances it just doesn’t meet the expectations that the student had in law school. Law school topics were more interesting and intellectual. The real practice of law is much less intellectual and much more scrapping. Some people really like that, but many people who like intellectual, and broad based, pursuits aren’t going to find that satisfied in a legal career which will instead be taking up by fights. I don’t know what this argues for, but perhaps what it somewhat suggests is that potential law students be encouraged to have a degree that has merits in and of itself, so that they don’t fall for the illusion that they’re stuck quite so easily, and they also know what another pursuit is like. I hear you – I did not find law school depressing at all. It was kind of fun, and a great break from having to work in a real job. I like to learn new things, and got to do that and socialize for 3 years. Win. Now, law practice in a big firm? MAJORLY depressing. Majorly. Welcome to 2 on the happiness scale, with fleeting realizations that being dead would actually be better than being in the law firm on some days. For similar reasons, I’m doubtful that the work on law student depression, and the work on lawyer depression, are addressing common factors or causes. What makes a 2 L really miserable and what makes a 3rd year associate in a big firm really miserable are very different.